For detailed information, please review our School Programs Brochure! Welcome to MarineQuest school programs, your classroom porthole to preK-12 marine and environmental education in coastal North Carolina. Experience the wonders of the coast with your students through hands-on classroom, field, and lab activities. 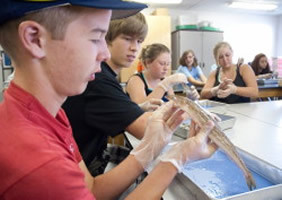 All of our lessons are based on state and national education standards, including Ocean Literacy Principles, and highlight the different fields of study that make up marine science. 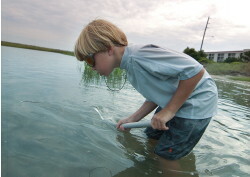 We offer three academic enrichment programs focusing on the marine science of our coastal environments. MarineQuest offers workshops throughout the year to give teachers new science skills, learn up-to-date marine science knowledge, and help teachers bring marine science into their classroom. Earn CEU credits and MarineQuest credentials. School programs are offered from September to May. To make a school reservation or to reserve a program date, please complete the Program Reservation Request Form (submission of form does not guarantee date is available). After submitting your program form, please follow-up with an e-mail or by phone to verify that it has been received marinequest@uncw.edu or (910) 962-2640.